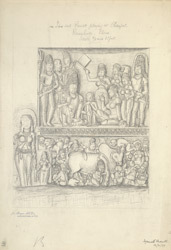 Rameshvara cave, cave XXI, at Ellora from James Burgess' 'Original Drawings [of] Elura Cave Temples Brahmanical and Jaina, IIII.' The spectacular site of Ellora is famous for its series of Hindu, Buddhist and Jain cave temples excavated into the rocky façade of a basalt cliff. The works were done under the patronage of the Kalachuri, the Chalukya and the Rashtrakuta dynasties between the 6th and the 9th centuries. The Rameshvara cave dates from the late 6th century and is part of the Hindu group. The cave is famous for its beautiful and sensuous carvings. The outer columns of the verandah have brackets adorned with female figures and on the left wall there is a carving representing the personification of the river Ganga. Illustrated on left is a pillar from this cave. On right, illustrated is a panel which is situated in the verandah and represents Shiva and Parvati playing dice. Nandi, their bull, is carved in the lower register.